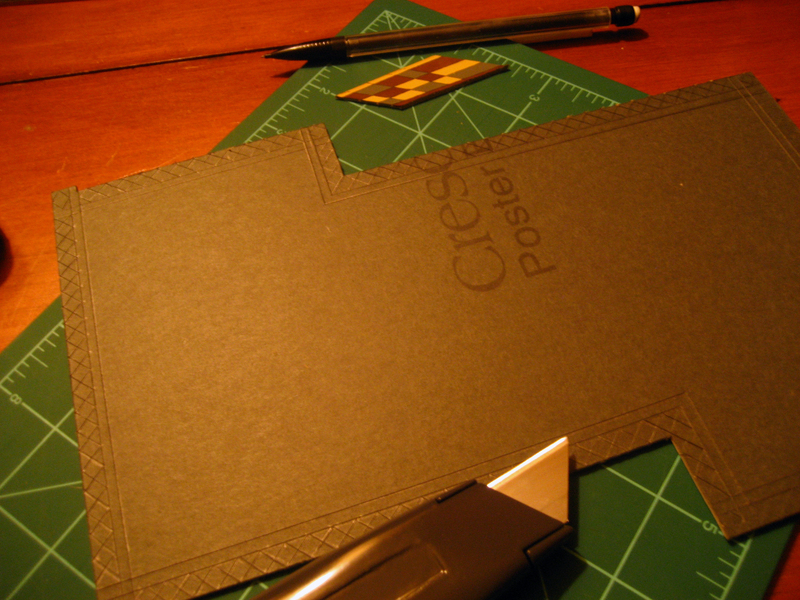 Toward the end of grad school, when I needed an outlet in the middle of dissertation-writing, I took the plans out again. 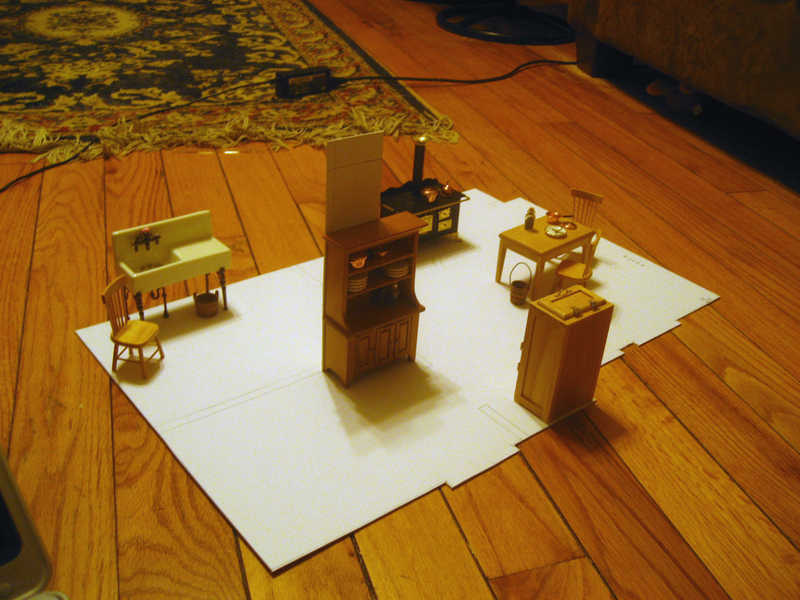 After having researched different ways of creating dollhouses, I concluded, due to my lack of wood-working skills, that I would do best with a poster-board walls / wooden studs and joists approach. 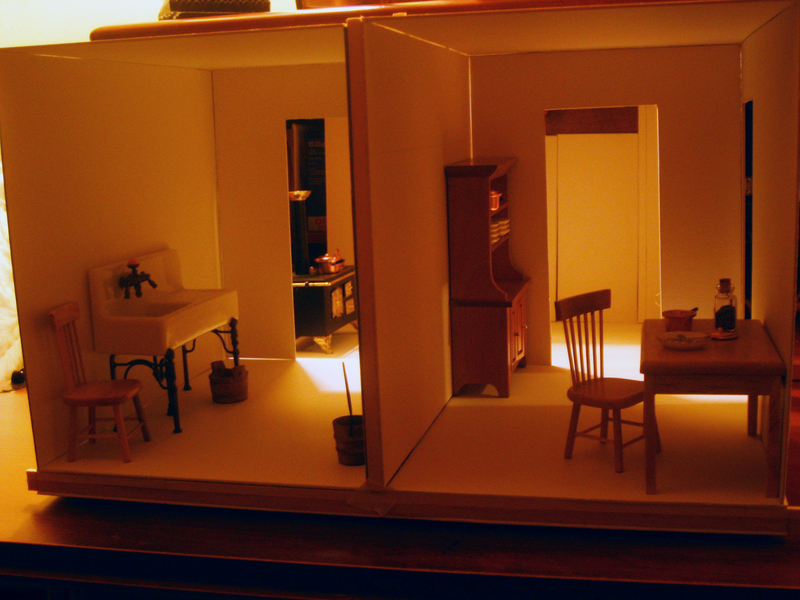 Apparently it makes for a lighter house but creates a solid framework…just like an old Victorian wooden frame house. So early in 2008, I got to work. 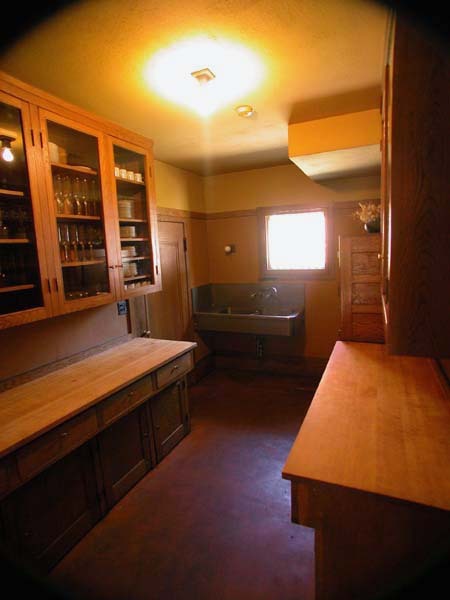 I started with the back of the house — the kitchen, scullery, and butler’s pantry area…I figured that would be the easiest place to begin. 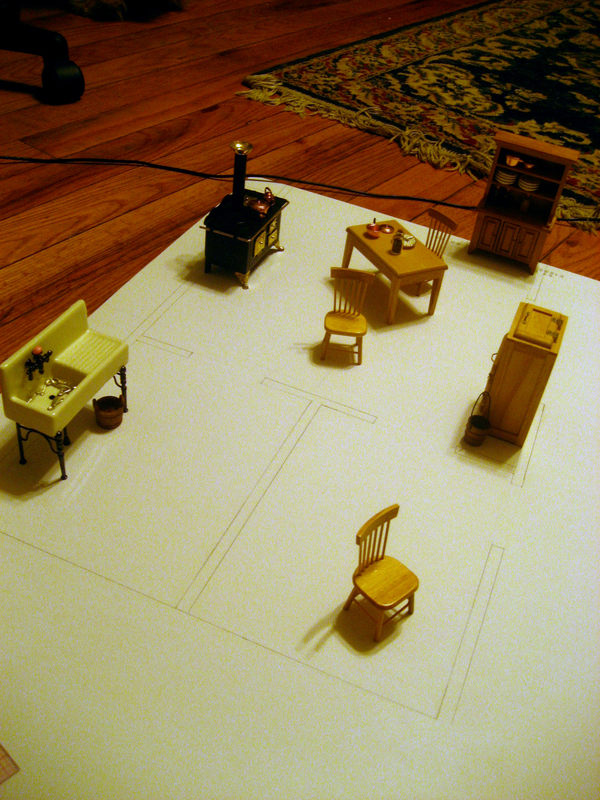 First, I traced out the floor plan on poster board and added some pre-built furniture to get a sense of the size of the rooms. 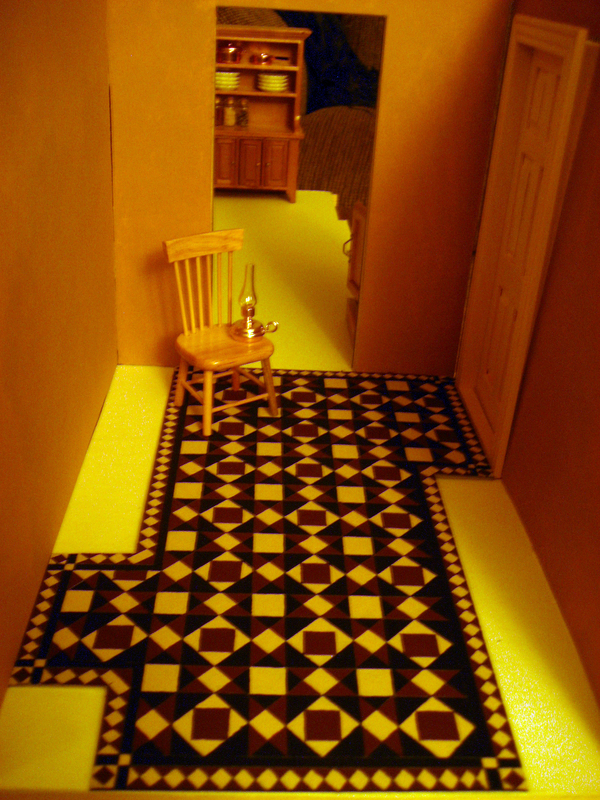 Then I cut the floor out. 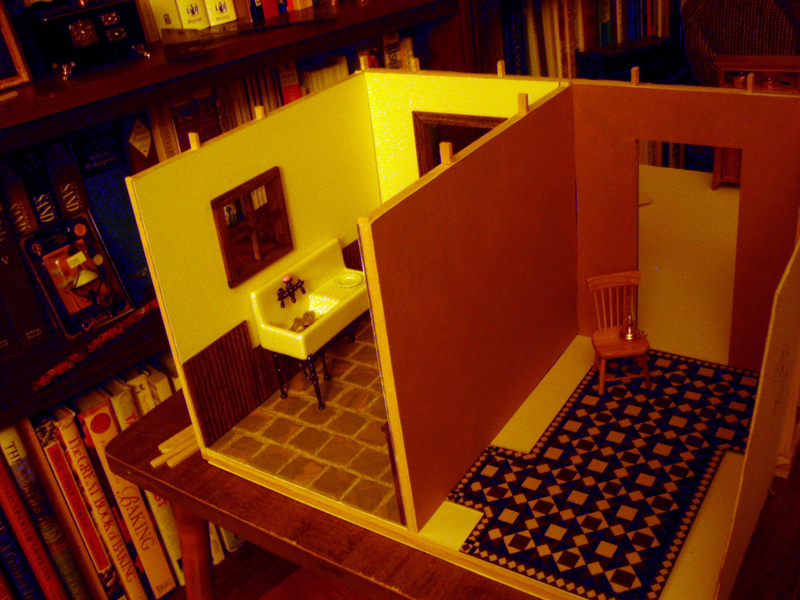 After cutting out a few walls, I propped them up to see what it would look like. 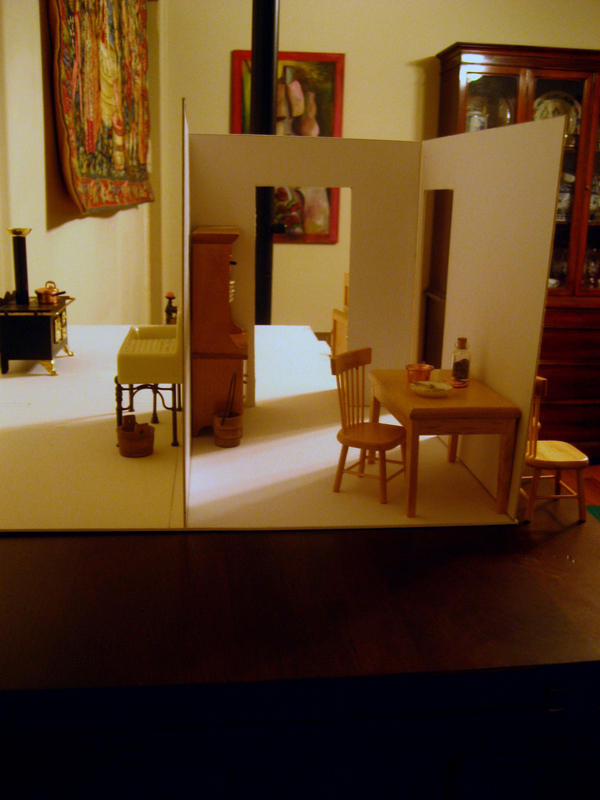 This is a view toward the kitchen, through the scullery on the left and the butler’s pantry on the right. 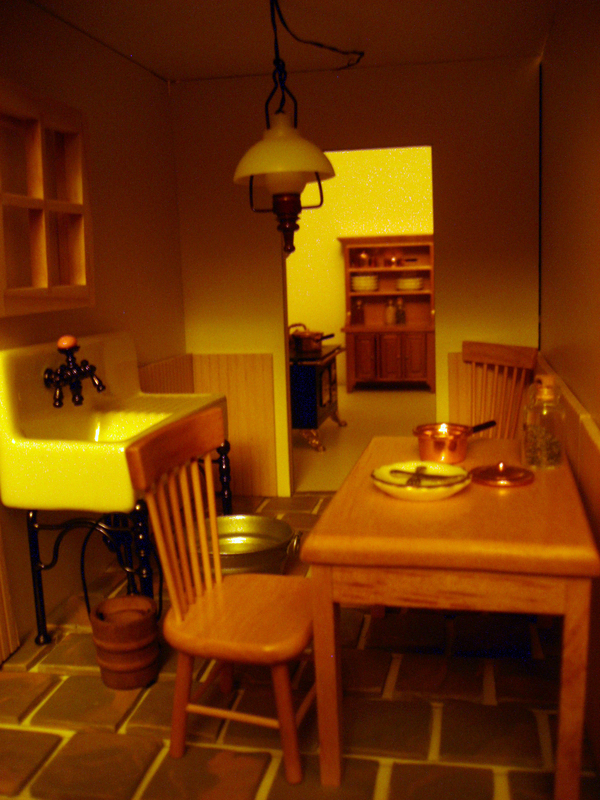 Then I got to work on the scullery / wash room. 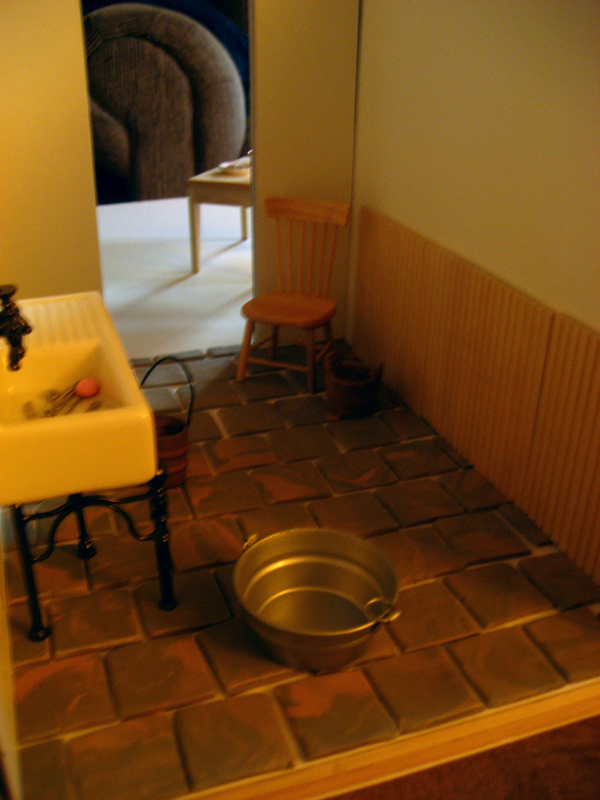 I figured this is where all the dish-washing and laundry would happen, so it needed a good, solid stone floor. 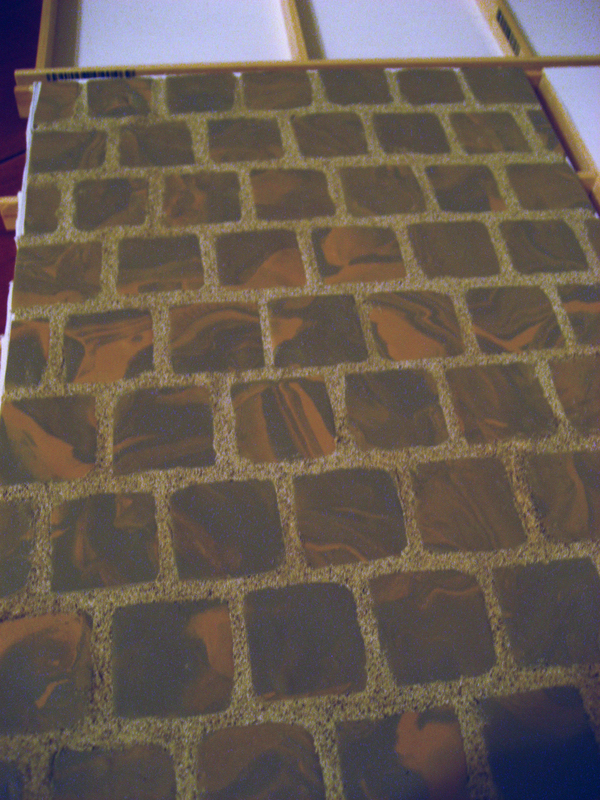 I found a couple of modeling clay colors that would work well and created these stone tiles, which I baked in the oven to harden them. 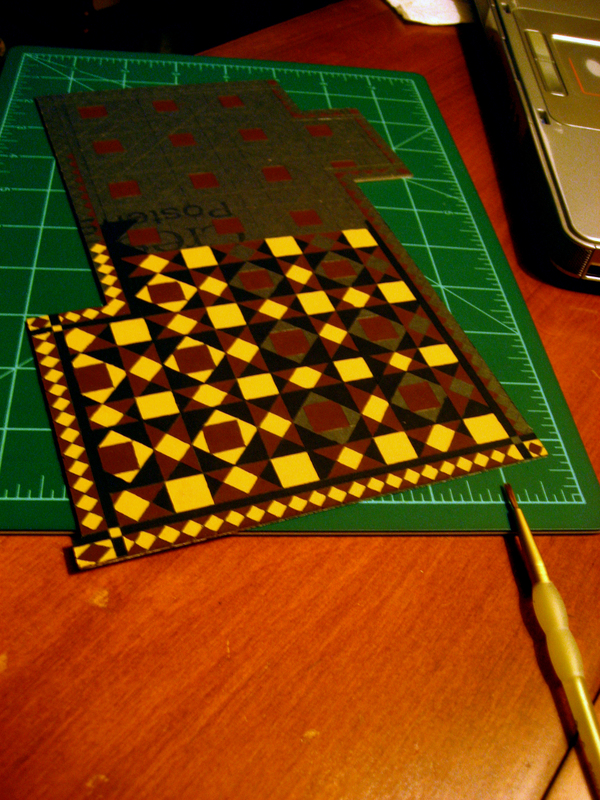 I experimented with various materials to form the sandy grout, and ended up using buckwheat flour and glue. 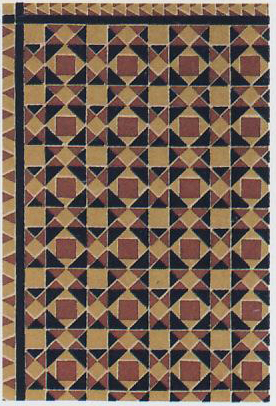 And also by a pattern for Victorian linoleum I found in a book. 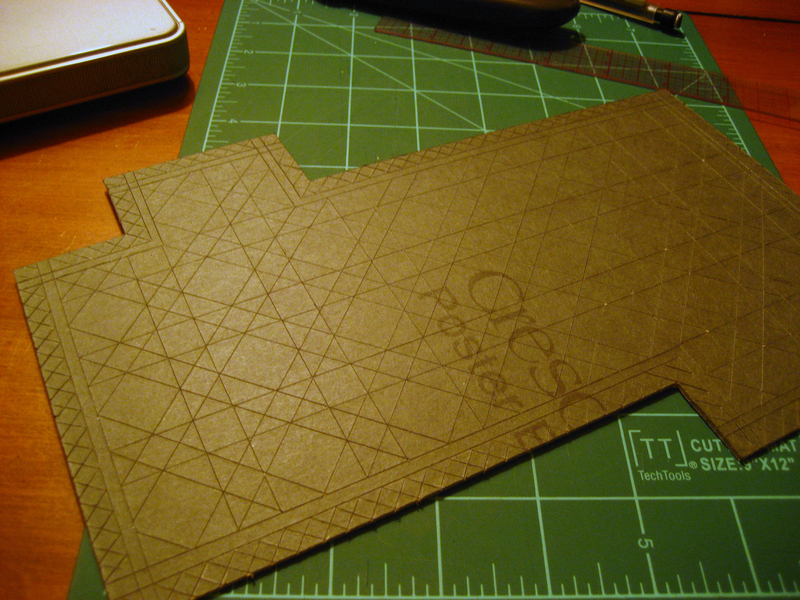 So I traced out a similar pattern on a piece of poster-board and used an X-acto knife to simulate the grooves. So I built a couple walls and a chimney to surround the stove I had bought. 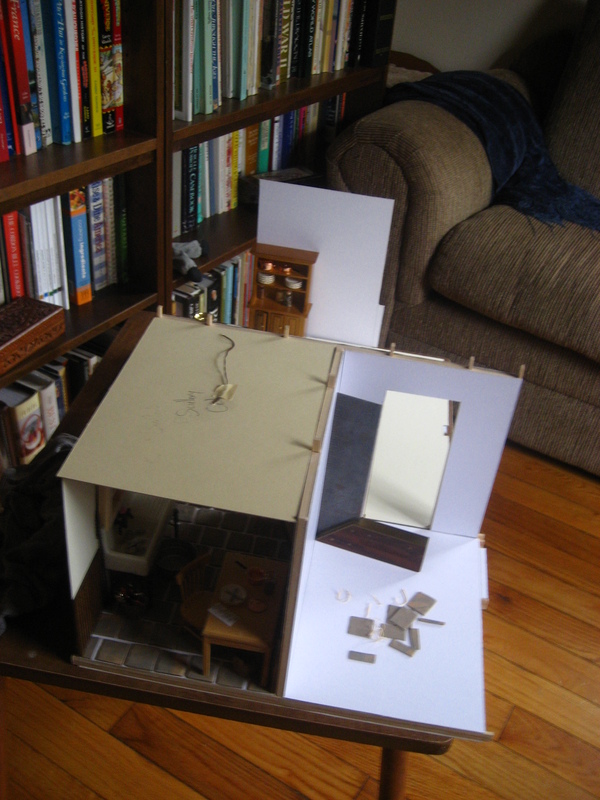 And then somewhere around that time, I got busy with other things (finishing grad school, looking for jobs) and I packed everything into boxes (the walls were not glued in yet so it collapsed easily) and forgot about it all. After a move to Indiana and a further move to Pennsylvania, I still had not unpacked the boxes, when, after having visited various local historic houses, I remembered I still had this in the garage somewhere. So I dug it out. It seems to have weathered the moves well. The buckwheat grout seems a bit destroyed (did something try to eat it?…) but the rest is just fine. 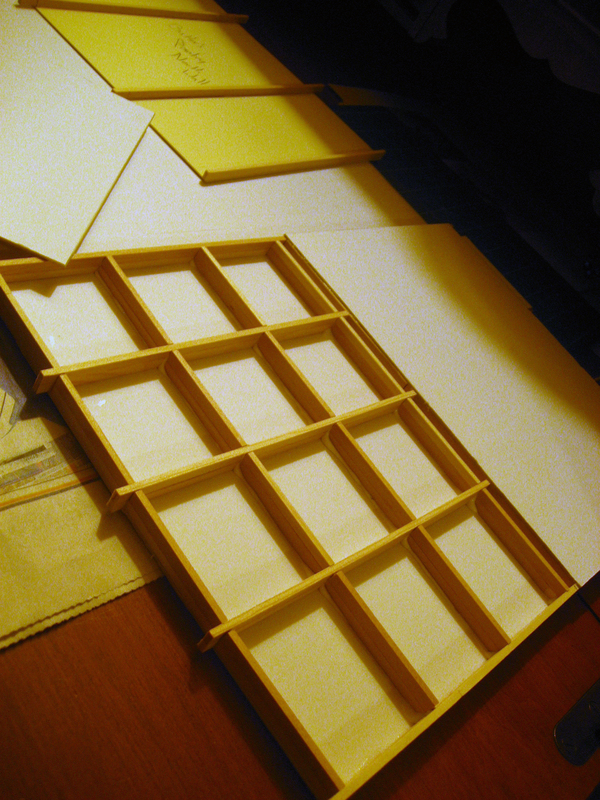 So now my challenge to myself is to go on with this project and document it as I go. Time, I’ll find some somehow. Inspiration, I have plenty of it. But technique, skills, materials, and patience…well, those I’ll just have to improvise as I go along. I love your idea of using poster board for walls, I think I have to try this for little additions I want to add to my house without having to break out any wood working skills!